A delicious shoulder piece of Andy Fenner’s Taste of the Karoo Venison, a box of herbs and spices and a bottle of Zonnebloem 2010 Shiraz Mourvèdre Viognier arrived at our front door this morning, courtesy of the lovely people at Zonnebloem. Andy is a bit of a demon in the kitchen and has cleverly developed this sublime dish where a coffee and spice rub is the link between the venison and the wine. I have long been a fan of Zonnebloem Wines and this aromatic, and fully flavoured red blend is alive with the flavours of bloodplums and berries and a gentle wave of white pepper on the long and waning aftertaste with an undertow of oak in which the wine was matured for a year. Read more about Zonnebloem Wines here where you will find a little story about Bonnie van Niekerk who made this wine, one of the formidable women of Zonnebloem. Preheat the oven to 150˚C. 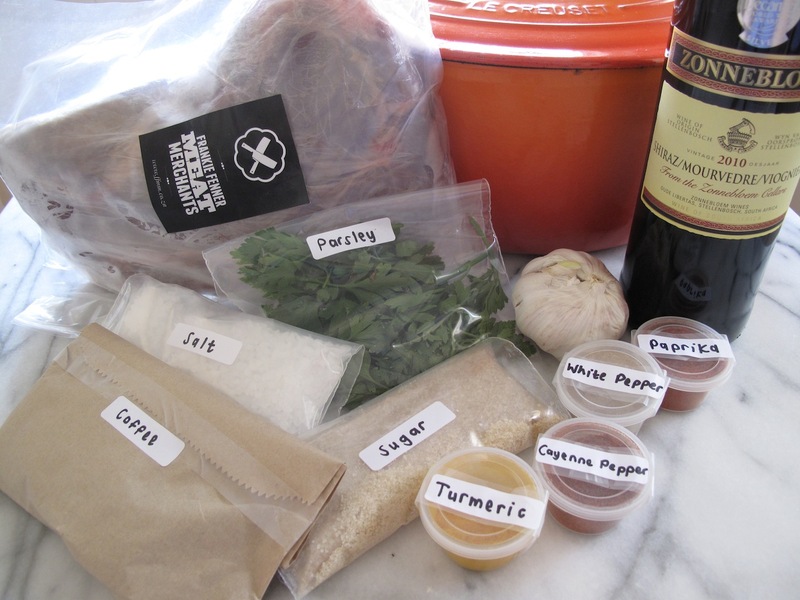 Make incisions in the meat and fill with the cloves of garlic. Combine the ground coffee, turmeric, white pepper, brown sugar, smoked paprika, coarse salt and cayenne pepper in a bowl and season the shoulder of springbok with this rub. 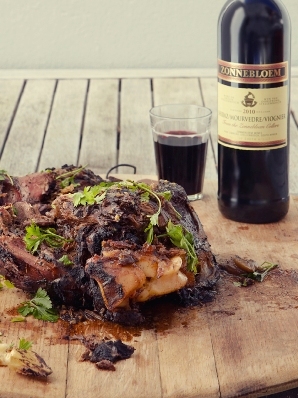 Place in a roasting dish and moisten the meat with a generous amount of Zonnebloem Shiraz Mourvèdre Viognier. Cover the meat and roast for 4 hours. Remove from the oven and let the meat rest for 10 minutes. Slice and garnish with flat-leaf parsley. To view a video clip of Andy preparing this dish, please go to here. And I am pleased I have a second bottle of the wine to enjoy with this fine dish of venison.